is Not Just For B2B Sales. Because Your Salespeople Aren't the Only Ones Talking to Your Customers. A Customer Relationship Management Tool (CRM) is a system that companies use to manage and analyze customer interactions by gathering information across a variety of sources inside and outside of your company, with the goal to ultimately increase sales. If you have reports coming from multiple systems, or you use many applications to manage customer interactions and data, then a CRM may be right for you. Once just a sales tool, CRMs have adapted to become part of your overall business strategy. We don't represent any one CRM, so we are here to help you find the BEST one for your business. We guide you through the process of implementing your new CRM to ensure the least disruption to your customers and your team and deliver the best results. Buying or Upgrading a CRM Requires Careful Consideration. Evaluate existing processes and tools and how your people interact with them. Download this self-assessment tool to determine your CRM readiness. According to Merkle Group Inc. 63% of all CRM’s fail. Is your company making sure they are doing all the right things before deciding on a CRM? 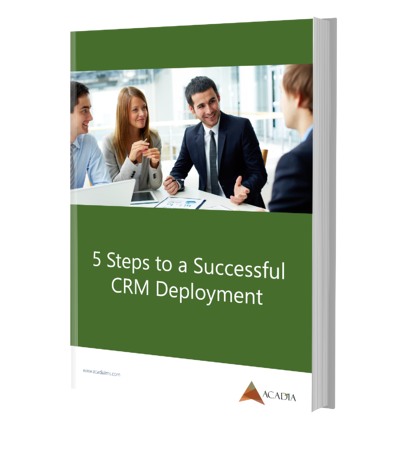 Check out our Ebook and be confident that your CRM is going to be a success. Define how a CRM will fit your business strategy from marketing to customer service. What functionality is critical? Who will access the system? How easy is the interface? What type of reporting is required? If you miss this step, you run the risk of purchasing the wrong CRM. All tools are not the same. Find the one that meets the '"must haves" from your assessment. Each department may have different requirements. A good CRM tool will be able to address them all. Be sure the tool you choose also has excellent customer service and training. This is the person in your organization that will lead and understand the software and how it will align with your strategy and teams. Your champion should also act as the interface between your organization and your CRM vendors or consultants. Your CRM champion and your CRM vendor will work together to ensure that your software is implemented properly and issues are addressed as they arise. They will define and document your CRM process for staged training and deployment. Make your CRM experience positive. Your CRM champion will lead the way, making sure that everyone in your organization is engaged in the process and embracing the change. Training well results in a seamless launch and a positive end result for all involved, including your customers. Aligning your people and processes with your new CRM tool requires continual refinement. This will improve internal efficiencies, so your sales people are more productive. You will also have increased visibility to your sales pipeline, so leads don't fall through the cracks. Purchasing and Implementing the Right CRM Will Provide Meaningful Information About the Health of Your Future Sales. We are here to help you to integrate a CRM to grow your business.